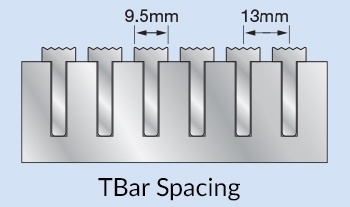 The aluminium and brass serrated tee bars as standard are 9.5mm wide and are installed at 13mm centres. The small gap between each of the tees provides a visually appealing product and allows dirt, dust and water to be trapped at the base of the grid, preventing the tracking of material or water onto floor surfaces. 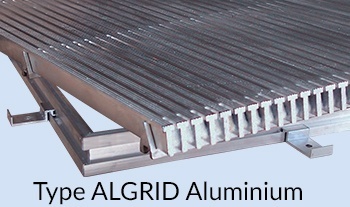 The grids can then be easily vacuumed to remove any build-up of dirt or debris. 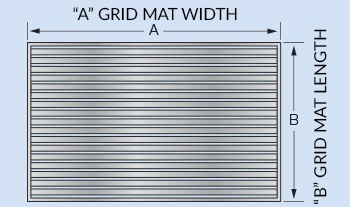 The narrow 3.5mm spacing’s between the tees are designed not to interfere with traffic movement over the system and it is recommended that all Lathamgrid grid mats be installed with the longitudinal bars left to right across the doorway as shown below. Latham Australia Pty Ltd has had independent testing carried out by a NATA accredited laboratory in Accordance with AS 4586-2013 Slip resistance classification of new pedestrian surface materials – Appendix A. While slider 96 or slider 55 rubbers may be used, the test report shall specify the rubber that was used. It is expected that these surfaces will have greater slip resistance when dry. SDV may be calculated by using the tables that are given in Appendix F, and the minimum SRV that is considered appropriate for a level surface (see examples given in Appendix F). Australian Standards are available through SAI Global, http://www.saiglobal.com, whilst the National Construction Code of Australia is available through the Australian Building Codes Board http://www.abcb.gov.au. 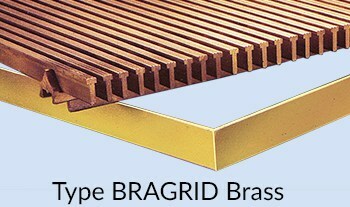 Have an enquiry about grid mats for your next project?